Something I always have in my bag is a small packet of Face and Body Wipes this particular pack is from Accesorize and only cost €1.50 and are Cherry scented. These are great in case you spill something on yourself, your eyeliner smudged or something else makeup wise may have went wrong or just for when you're coming out of Boots with an arm looking like a rainbow from tons of products you've just swatched. I also like that because it's a small packet (contains 10 wipes) that it doesn't add any weight or take up any room in your bag! The next thing I have with me during the warmer weather is a Travel Sized Dry Shampoo. In the warmer weather my hair tends to start looking oily quicker than if I was in the shade all day so if I feel like thats happening all I have to do is quickly spritz a little into my hair and I know it will keep any oils away. I would normally have a Batiste one but at the moment I'm just using up the Colab one before buying a new one. Finally Tan tights! When it comes to going to events I prefer to wear natural tan tights because I don't tan and my legs are so white they reflect! However these things are so delicate and when you have long nails or are just clumsy you are bound to either rip them yourself or get a thread caught in something and cause a ladder. I got this packet in Primark which is exactly for emergency's when such things happen. On the packets it says 'Phew! Spare pair #2' and 'Help! Spare pair #3' while the first one which isn't pictured says 'Oops! Spare pair #1'. These come in packs of three and only cost €2.50 and I'm almost certain they do them in the navy and black styles too! 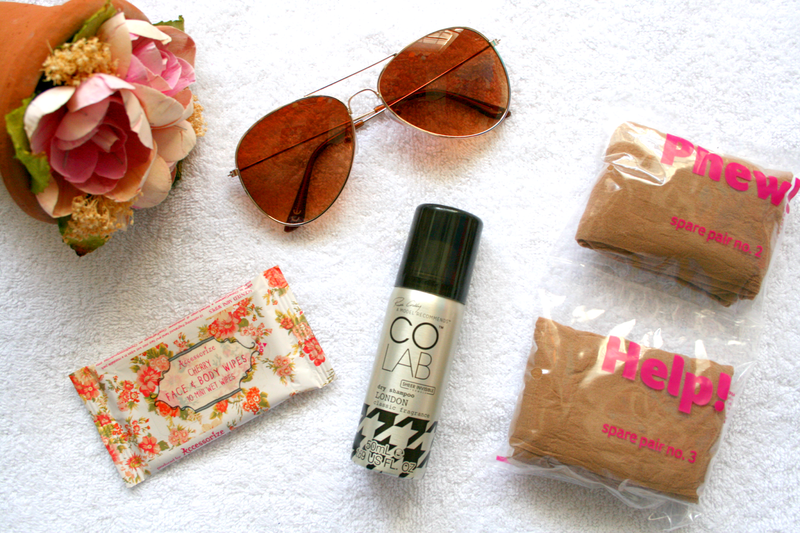 What are your main essentials in your bag this Summer?